Ask the Professor: What was the social impact of “I Am a Fugitive from a Chain Gang”? I Am a Fugitive from a Chain Gang (1932) is a pre-Code, early talkie (a film with synchronized sound, as opposed to the silent films of the pre-1927 era) that continues to resonate with cinephiles today. The film is highly critical of the U.S. legal system and the potential for justice in this country. Many of the film’ social messages feel just as apt today — particularly concerning our society’s failure to take care of returning soldiers and tendency to let people fall through the cracks. ScreenPrism: Was the film daring at the time, and do you believe its social commentary is as relevant today? Professor Marc Lapadula: I Am a Fugitive from a Chain Gang has a scene in which James Allen (Paul Muni) is so hungry that he is forced to pawn his war medal, and that medal rejected by the pawn shop owner. His honor is rejected. It can't be clearer than that. And he's not alone—there is a whole lost generation of men who came in before him. They at least got something; at least their sacrifice was worth enough for a burger and a Coke. This guy, he's effectively told, You waited too late to cash in on your valor. So we've moved on. The big march of progress moves on. A pawn shop is the place where everything is an antique; everything there no longer serves its original utilitarian purpose. It's the scrap heap of history. Well, guess what? The scrap heap of humanity in the 1930s is the chain gang. Once you throw somebody on to that thing, that's it; they're over. We don't ever expect them back. The irony is that James Allen (Paul Muni) is an innocent man. He is a war hero, and he's somebody who is a very productive and valuable member of society, when given the chance. That movie is just wall-to-wall tragedy, unrelenting, and extremely daring for its time. It doesn't solve anything; it just presents social problems, multiple social problems, and it's up to us to make a difference. It did get people writing their congressmen (they were all men in those days). Back then, Congress did this thing called their job, and they got together, and they passed legislation. They tried to extirpate some of the inequities of the penal system. So they did clean up some things, and this was an example where art influences life. I Am a Fugitive from a Chain Gang was based on a true story. 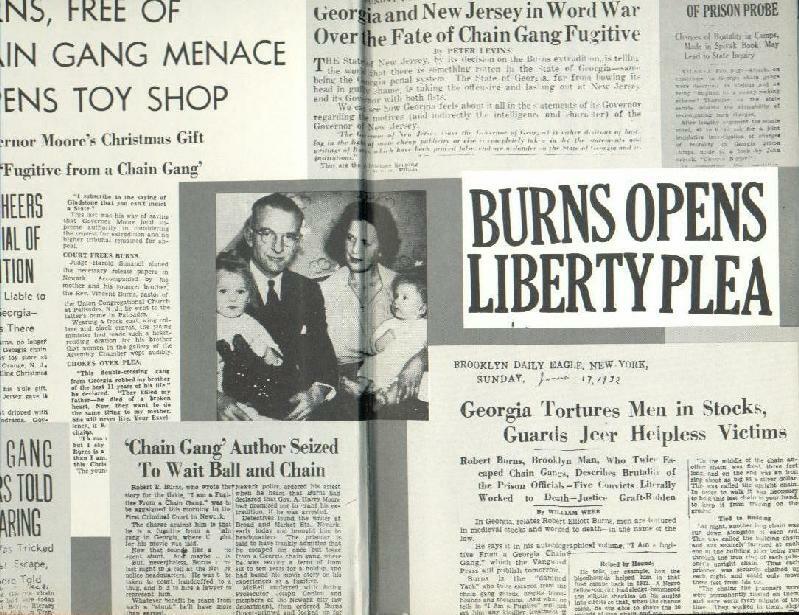 The real person, Robert Elliott Burns, was at large — he was an innocent man who had escaped twice from the chain gang when the movie came out. He was eventually pardoned in 1945. Down in Georgia was where he ran into all the trouble, and Georgia did lure him back saying they'd give him a full pardon, just like in the movie, and then they threw away the key. They lied. They betrayed him. He escaped again, and he was at large in 1931 - 1932, when the film was made and when it was out. People found him very sympathetic, but he wasn’t pardoned immediately after the movie came out. It took 13 more years before he was pardoned. Still, a lot of people were upset by the movie, and they wrote their congressmen. They were mad that this was happening. There was major outrage with this kind of behavior by the chain gang guards. The audience had no idea that people could be treated like that, and again, because he was innocent and because he was a good guy, this was a miscarriage of justice. SP: Do you feel that people don't react in the same way when they see an example of injustice on screen today? ML: Well, that's the thing: where are the movies today that show all this injustice? That's what I'm wondering. Movies today, they're so entertaining; they’re so action-packed; they're so violent that we’re now numb to the violence. We now have people who come into movie theaters with automatic weapons and start shooting up the audience, and as a nation we still can’t get together to at least stop these individuals from getting a hold of high-powered paramilitary firearms. We are in a very different era. I guarantee you that in the 1930s if people had gone into a movie theater and started shooting, there would have been real ramifications. But there wasn't a huge gun lobby back then. We’re a nation of over 300 million. Five million people in the NRA sounds like a lot, but not when that’s up against 296 million people, and I don't think all those five million believe that it should be carte blanche for people to get a gun. And yet look what's going on: if you even talk about it, people get mad. Just try to discuss this issue, and they get upset — they don't want their rights to bear arms to be encroached upon. I'm all for people having their rights protected, and they should be able to hunt and protect their family and all, but anyone with a gun in this country should be responsible with it, and they should be trained. There are countless stories of a toddler shooting somebody or killing themselves. It happens all the time. Kids get killed. We are a nation with a history of violence, and we just seem to roll with it. And our movies reflect that. Darryl Zanuck produced Fugitive From a Chain Gang. His son, Richard Zanuck, produced Jaws (1975). I Am a Fugitive from a Chain Gang was a real blockbuster. It was literally around the block—busted the block. People could not wait to see this movie, and again this was a movie that has a downbeat, tragic ending. Read more from Ask the Professor: How does "I Am a Fugitive From a Chain Gang" comment on rigid class structure? Ask the Professor: How does “I Am a Fugitive from a Chain Gang” comment on rigid class structures? Ask the Professor: How does early talkie “I Am a Fugitive from a Chain Gang” use sound creatively?